We are serving a variety of HOT and Cold Breakfast items daily. At Bethel-Tate Schools, we know that good nutrition and learning go hand in hand! BREAKFAST IS ONLY $1.00 FOR ALL PAYING STUDENTS, WE OFFER HOT AND COLD CHOICES. REDUCED BREAKFAST IS ONLY $.30 AND STUDENTS WHO QUALIFY FOR FREE LUNCH GET FREE BREAKFAST . This year, Bethel-Tate school cafeterias are meeting tough federal nutrition standards for school meals, ensuring that meals are healthy and well-balanced and provide students all the nutrition they need to succeed at school. USDA has changed the format of a school lunch and many of the changes started with the 2012-2013 school year. 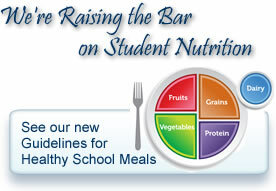 In our district, we have already made progress toward meeting the new nutrition standards. We serve fresh fruits and vegetables. We have already made the switch to 1% or fat-free milk. Most of our sandwiches are served on whole grain bread items and entrees, and have introduced several new lower sodium entrees. We will be building on the progress we've made and planning our menus for the 2018-2019 school year to meet the new nutrition guidelines. We'll face some challenges to meet all the new requirements on a tight budget, but our nutrition program will work hard to make these healthy changes for our students. We look forward to welcoming the students to the cafeterias this fall. School meals are a great value and huge convenience for busy families. We hope parents will support this effort by encouraging their students to give the healthier meals a try. Students are far more likely to pick up a fruit or vegetable in the lunch line if they have been introduced to those foods at home. We are looking forward to serving you in the 2018/19 School Year!